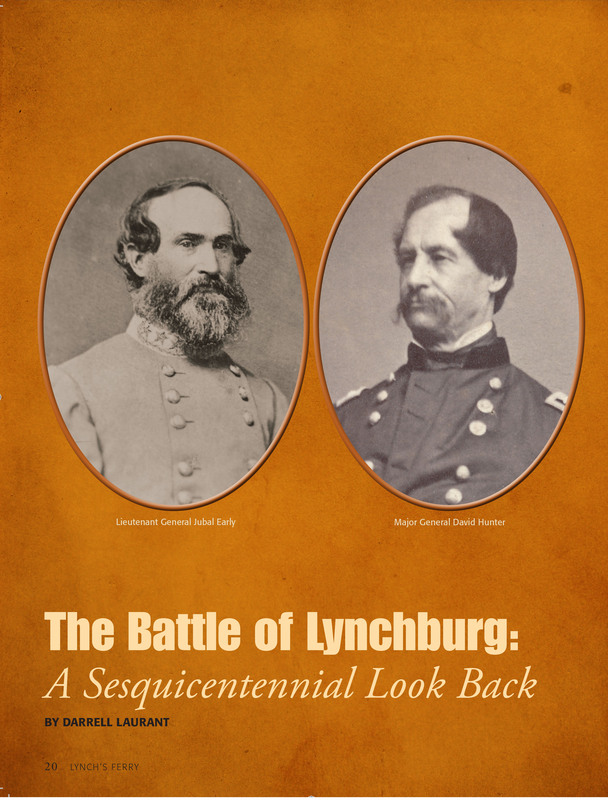 Half a century from now, when the nation pauses to commemorate and contemplate the 200th anniversary of its civil war, there is a good chance that the Battle of Lynchburg will have risen in historical stature. This three-day clash of Union and Confederate forces in mid-June of 1864 grows more interesting the more it is examined. Unlike many battles that turned chaotic during the conflict, the goals and strategies here remained clear-cut. One side was obviously on offense, the other on defense. In the end, the winner and the loser were indisputable, and the result had farreaching significance. Moreover, the two commanding generals were both colorful and intriguing figures, surrounded by controversy throughout their military careers. Union Major General David Hunter was born in Troy, New York,1 and grew up in Washington, D.C. Much of his ancestry was actually Virginian—a fact that led some Southerners to consider him a traitor for joining the Union cause. Deeply religious, he was a teetotaler who never smoked or even swore. Yet his was an Old Testament faith that impelled him to punish the South at every opportunity for what he saw as its cardinal sin of slavery. So zealous was Hunter in this regard that early in the war he declared all the slaves in South Carolina and Georgia freed. This order was quickly rescinded by President Lincoln, who was still months away from his Emancipation Proclamation and worried about offending the border states. the founder and director of The Writers’ Bridge, an international marketing service for freelancers. Laurant has authored more than 150 freelance magazine articles, two non-fiction books (Even Here and A City Unto Itself), and three collections of newspaper columns. His first novel, The Kudzu Kid, has just been published.